It used to be said that the thing which distinguished humans from the rest of the animal kingdom is that we are intelligent enough to design and use tools. This was disproved in the 1960s during the observations of chimpanzees by Jane Goodall when she recorded them using twigs to extract termites from their mounds. However they do not have a strong grip nor the dexterity with their fingers to hold the types of tools we use - no opposing thumbs. This is thought to be one of the reasons Homo sapiens advanced to become the dominant species of the primates. Further study of our fellow creatures has revealed more examples of their use of objects to help with tasks, such as members of the crow family using twigs and other objects to obtain food that is out of reach of their beaks. But when it comes to quantity and variety we beat them hands down. The range of garden tools is certainly endless and every year new ones are introduced promising great benefits over anything that has gone before. The Victorians loved their gadgets and in the latter half of the nineteenth century the number of tools increased greatly. The majority are not what they are claimed to be and after one or two uses, like kitchen gadgets they end up occupying space in a cupboard or the tool shed, never to see the light of day again. Apart from the most useful tools we possess - our hands - the range of tools needed to tend the average garden is small. Try to buy tools made from forged metal as it has been tempered to align the particles, giving it tensile strength. Tools pressed from sheet metal are weak and corrode more easily. A good quality handle made from ash or fibre-reinforced resin will be much stronger. Always try them for comfort and ease of handling before purchase. Many tools for use in the standing position have handles that are too short and can cause back strains, usually spades or forks. This applies as well when buying garden tools for a gift, try to think how the recipient will use it, or it might be better to give a voucher so that he or she can do the choosing. For small hand tools choose ones which have bright handles so that they will be easier to spot among foliage or against soil - why so many are made with green or black handles is a mystery! Some bright paint or adhesive tape can be applied to make them stand out. Second-hand tools can be good quality, and have many years of usefulness left in them. Look in junk shops, auctions and car boot sales. There is the old story of the yard-brush said to have belonged to a grandfather, it has had six new shafts and a dozen new heads and is still going strong! Garden tools made with copper-based metals are regarded by some to be beneficial to the soil, possibly by adding traces of the metal as they are used, or because copper is non magnetic. The tools are usually made from beaten bronze, an alloy of copper and tin - this makes them hardwearing. They do not corrode as easily as iron tools and look very elegant, if a little pricey. Whatever tools are chosen, they will last much longer and perform better if a little care is bestowed on them. Clean off any soil and return them to their regular storage spot so you will always know where to find them. Don't leave them outdoors where the metal will rust and wooden handles will rot. A rub over with an oily rag will preserve the metal. Wooden handles will last longer and be more pleasant to hold if given a rub with boiled linseed oil occasionally. If a wheelbarrow is required, choose one with a pneumatic tyre, solid tyres are difficult to get over the slightest bump and are very noisy. A watering can can be used with a fine rose on seedlings, with the rose removed to "puddle in" plants or with a sprinkle bar to apply weedkillers. Though it is preferable to have a separate one for the latter use, also a different colour, usually red. the more expensive metal cans may be more attractive, but they are heavier than plastic. There is information on lawnmowers in the lawn maintenance section. Other mechanical equipment required once a year or less frequently can usually be hired. With the advancement in battery technology their convenience over corded models make them easier to use. Again as with hand tools there are some which have limited use so are unnecessary. Find some of the tools mentioned here at Amazon. Used mainly for planting and cultivating the spade should be the correct weight and have a suitable length and girth of handle to be comfortable in use. Many of the spades sold are much too short for taller people, if the blade does a good job it may be possible to replace the handle with a longer one from a hardware shop. The blade has had many transformations over the years. Different regions have produced a spade best suited to the local soil conditions and the task to be carried out. For example a long narrow one for heavy stoney ground and wider, shorter ones for lighter soil; the narrower blade is usually more angled and is useful for digging field drains. Some of the first spades were made from wood and must have been a nightmare to use. The best one has a forged blade set at a slight angle, not straight in profile nor made of pressed steel, ie. folded out of sheet metal. The choice between carbon and stainless steel is down to frequency of use. If the spade spends most of its time in the shed the stainless one will stay smooth and will pass easily through the soil. A thin layer of rust will form on the surface of the ordinary steel one if it is left for any length of time, and will tend to clog up with soil during use. The stainless blade wears away quicker, so may not last as long with frequent use, as a good quality forged one of similar price. Most of the spades available are similar in shape and are of two sizes - the digging spade with a broad blade (right) and the border spade (left) which is smaller and lighter. The latter is also useful for digging narrower drains and post holes as it removes less material. They tend not to have a proper tread on the shoulders of the blade, the sharp point is painful on the foot and cuts into the sole of shoes and wellington boots, ruining them. There are small plastic guards which clip on, but the best remedy is to have a small piece of iron bar welded on to make the shoulder thicker. Slightly lighter and with a similar overall profile to the spade, the garden fork is best for cultivating soil, especially in new ground. The tines are much easier to push into the soil if it is stoney and in clay soil it breaks up the clods more easily. Also when removing perennial weeds it is easier to tease out the roots without cutting them. As with spades the length of the handle is important for ease of use. Some people recommend using two forks back-to-back to tease apart the roots of perennial plants when dividing them, but with some roots it is best to cut them with a spade or an old kitchen knife. Stainless steel does not have an advantage over carbon steel as a little rust on the tines will not signify - the choice is purely a cosmetic one. In fact good quality carbon steel tines will probably last longer and may be more resistant to bending. 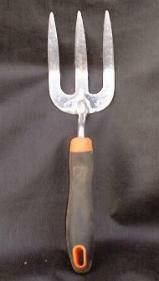 As with the spade there are two main sizes - a digging fork and a smaller border fork. The smaller size is sometimes called a 'lady's fork' as it is easier to handle. For smaller jobs such as planting bulbs and bedding plants in cultivated soil. A stainless steel version is probably best as the blade stays cleaner and is easier to spot if left lying around. Choose one made from forged metal rather than pressed steel as one good heave will leave the latter version bent or broken. The whole tool or part of it can be used as a measure when planting out. The most useful garden tool when hand weeding to loosen the soil around the weeds and ensure that all of the roots come out. Then afterwards a general scuffle over the surface leaves a tidy finish. It can also be used for planting out. A stainless steel one has a nicer feel when working and is easier to spot in the flowerbed. Another use is to scribe along crevices in paving to dislodge moss and weeds, although this can result in uneven wear. The two main types are the draw hoe and the cutting hoe. The draw hoe has its blade set at a right-angle to the shaft and is used to draw soil towards the operator when making planting drills or when mounding-up potatoes. The cutting hoe is pushed back-and-forth, just below the surface of the soil in a sliding motion and is used for weeding. The blade is more in line with the handle and there are a few designs, the most common being the Dutch Hoe where the flat blade is supported on each side in a D-shape. The Swoe (pictured) has a pointed blade facing sideways from the handle supported on one side, which is easier to use between plants. The blade of both types should always be sharp to cleanly sever the topgrowth from the roots, it also reduces the effort needed to use them. They are used frequently to catch the weeds as early as possible. In dry weather the constantly disturbed surface develops a 'dry mulch' which conserves moisture below it and is less likely to induce seeds to germinate. Even with perennial weeds, if they are frequently deprived of their topgrowth, they will die away. It may be necessary to sharpen the blade quite frequently with stoney ground and a sharpening stone is handy to have for this. If really blunt a grinding disc or wheel may be needed, but care must be taken to avoid overheating as this will destroy the tempering of the metal - the surface will become bluish if it is getting hot. The conventional draw rake (top left) is used for levelling soil, gathering stones on the surface and when preparing the tilth on seedbeds. So after the grass is sown it may not be needed unless you have a vegetable plot. 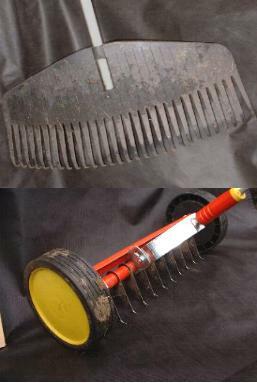 The spring-tined rake (bottom left) is great for removing thatch and moss from the lawn. This one has done a lot of work and has been retired. 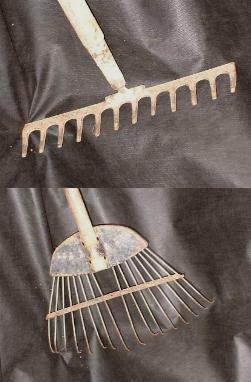 A leaf rake (top right) is probably the most efficient tool for clearing up a heavy drop of leaves. It can also be used to distribute a topdressing on the lawn, working it down into the sward. After raking up the bulk of the leaves on gravel a leaf blower will gather the last few missed by the rake and lift stuck down, wet leaves on hard surfaces. The Wolf Garten scarifier (bottom right) more efficient than the spring-tined rake. Its solid, hooked tines cut through the toughest thatch and the wheels keep it at a constant level. There are two main types with bypass or anvil blades. With the former the blades move past each other to make the cut and with the latter a thin, sharp blade is brought down onto a flat one. The bypass gives a cleaner cut with less crushing of the stem and if pruning a side shoot the cut can be made closer to the main stem. Some have a ratchet mechanism to reduce the mechanical effort needed to perform the cut - the handles are closed a few times to bring the blades together. A spring between the handles moves them apart for ease of use, and there should be a small rubber buffer to cushion the closure point which reduces the risk of repetitive strain injury. After repeated use the blades become covered with dried sap which tends to push bypass blades slightly apart, so giving the appearance that they are blunt. To remedy this use fine emery paper on the insides of the blades to remove the residue. One of the blades of bypass secateurs is thinner and sharper than the other and can be sharpened, the other one should be left alone. The thin blade on anvil secateurs can also be sharpened. There are a number of handy diamond encrusted files and carborundum stones available for the job. If pruning out diseased material from a plant, the blades should be disinfected before using on another job. Use a cloth soaked in methylated spirits or play a flame over the blades - a lighter will do. Felco are considered to be the 'Rolls-Royce' of pruners. Made by the same company as the Swiss Army knife, spare parts are available and the whole implement can be refurbished if it is returned to the distributor for a fee - search for 'felco secateurs service' online. With the advent of hedge trimmers and line trimmers, even in the smallest of gardens, shears are not used as often now. They still have their uses for doing topiary and removing faded foliage in the perennial border. Also for a really sharp edge on the lawn there is nothing to beat long-handled grass shears. As with secateurs, dry sap builds up on the blades so it should be removed with fine emery paper to keep the shears working efficiently. The shears pictured have extendable handles for better reach. These are more or less heavy duty secateurs with long handles for cutting thicker branches, and come with similar bypass or anvil blades. To reduce the effort needed to operate them some have a lever system or telescopic handles which also allow for better reach. Others have a rachet system, but this makes the opened tool very wide when opened and difficult to manoeuvre in tight spaces as well as reducing the reach. For pruning trees and climbers, there are loppers which fit onto extendable shafts and are operated by a pully system or levers to give a reach of 5 metres or more. Very useful for removing branches which are too thick for secateurs or loppers, and when working in confined spaces. The blade is curved and the teeth are ground so that it cuts on the pull stroke - the curve forces the blade into the cut. This is very effective for one handed operation and if the saw is used on an extended handle. The one pictured has a removable handle which allows it to clip into an extendable shaft to reach into trees or across thick hedges. There are also fold-away versions which fit into the jacket pocket. 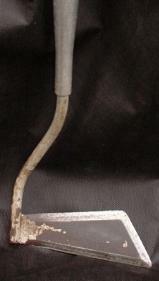 A mattock resembles a pickaxe and is mainly used for uprooting shrubs and small trees. 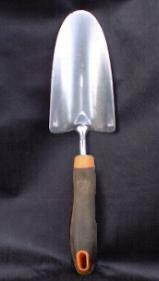 The flat blade is used to dig out the soil and the sharp axe end for cutting the roots. For smaller specimens and brambles, one swing with the digging blade usually does the job. It can also be used like an Azada or chillington hoe for loosening hard soil and for scraping off a dense area of weeds, before digging. Both blades should be kept quite sharp with a file or an angle grinder. When using the latter be careful not to overheat the metal as it will destroy the temper installed in the metal during the forging process; use short strokes and stop if a blue colour starts to develop indicating that it is to hot.